What goes in must come out; well that’s what the doctor says! So, it seems fitting that the same applies to our engines and while we mostly concentrate on squeezing more power (via increased air / fuel mixtures) from within our engines with improved turbos, superchargers or engine management modules, many forget the egress of gases may just well be the blockage that’s restricting maximum performance. That’s not to say bigger is better; like all good things, there are parameters that need to be adhered to. Take for example this 4.5L TDV8 engine in the Troopcarrier (the 70 Series range as well as the 200 Series), while the standard exhaust system is too small diameter and restrictive, we’ve seen and heard many going overboard with overly large diameter dump pipes and exhausts that do little than create noise and (perhaps) help on the quarter mile dragstrip… big deal for most of us eh who tour, tow and use our 4x4’s as intended! And, that’s not even going down the longevity, or lack thereof, route. The system we’ve fitted to this Troopy is not outlandish, not suited to drag racing and certainly doesn’t exceed noise limits, but by crikey it sounds beaut! I’ll admit to loving the sound of a deep rumbling V8 and having eight cylinders slapping up and down under the Troopy bonnet was indeed a drawcard… until I heard how dull it all sounded as stock. That was easily fixed via a trip to Taipan XP exhaust system HQ in Queensland and the fitting of one of their 3 inch aluminised steel (304 grade stainless is also available) mandrel bent systems complete with Vortex sports muffler, resonator and ceramic dump pipe. Let’s skip to the end result before getting into more nitty gritty stuff… the throbbing that’s emitted out the rear end is awesome, not too harsh, not too loud, definitely not sounding like a sick barking dog that some other systems suffer, nor does it sound like a sack of farting elephants like I’ve heard on many a Cruiser; it’s just simply AWESOME. Yes, the ‘sports’ muffler we had fitted is a little louder than the standard muffler Taipan offers, but having clocked four and half thousand kays since fitting, including a long distance run towing a caravan, I’ve not had one single complaint from my sensitive wife… so it must be okay! Taipan include a ceramic coated dump pipe, which is effectively a slippery surface to help heat and air to escape faster and also has a threaded plug to accept a pyro gauge to keep track of engine temps. The ceramic coating also prevents heat soak coming up into the floor right where the passengers feet are, plus offers improved longevity. A nice touch was the fitters moving the Troopy air conditioning drain pipe (that drips water) to prevent it from dripping on the new system. The route of the Taipan system follows the original system albeit tucked up higher above the chassis rails and notably the tail pipe also exits higher than standard to improve departure angles and prevent back-end scraps. A Vortex muffler spins and speeds up the expelled exhaust gases to aid in the free flowing characteristics as well as helping to reduce exhaust gas temperatures. A dedicated diesel specific 200 cell catalytic converter offers improved emissions controls as well as being higher quality than stock as well as maintaining legality – any vehicle that came from factory with a Cat’ must have one fitted if a replacement exhaust system is fitted. 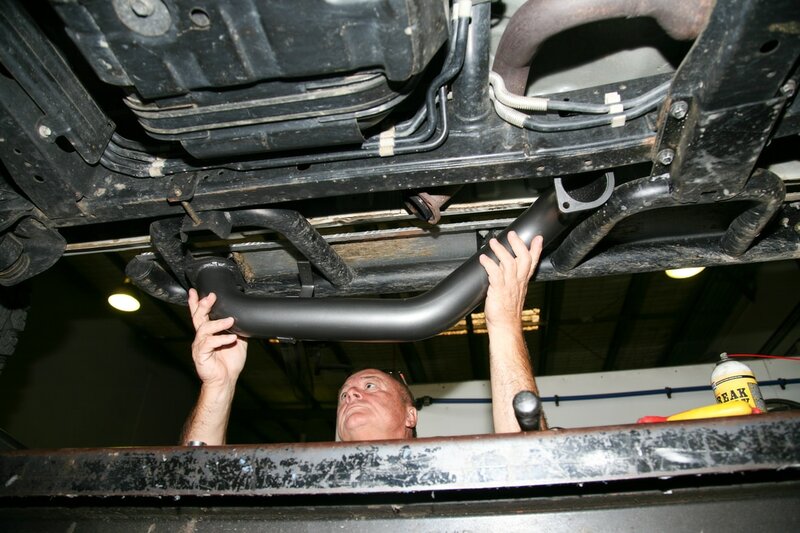 The 409 stainless steel flex bellow helps smooth our vibrations from the engine to the exhaust system, reducing chances of cracking and damage to other fixing components. Notably, all flange plates of the Taipan system are 10mm thick to prevent warping and the lads also change the O/E exhaust mounting rubbers during fitting, which, even though this Troopy only had about 20,000 km’s where already compressed and deformed from their original shape. An important inclusion is a small tailpipe resonator, which helps rid offensive barking noises often heard on some systems after stabbing the go pedal and backing off quickly. Having driven the Troopy with Taipan exhaust a for a couple of months now and noting that I’ve not had it dynoed, I can feel it’s freer flowing and takes to revving out faster and easier, while maintaining torque given the backpressure has been kept – something a too large diameter and too free flowing system will lose out on… unless other modifications are done. While we’re mentioning ‘other modifications’ this 3 inch exhaust system is a much-needed ‘accompaniments’ for when fitting engine management modules. While most modules will increase EGT’s given they are upping the power outputs, the free-flowing exhaust will help reduce those same (potentially) engine-damaging heat increases – so it’s a win win fitment of the two products to safely increase all round power outputs without creating problems for your engine. All up, the complete system is made in Queensland, is offered in DIY kit form if needed and offers excellent quality, increased off road clearances and returns an awesome note… so much so that I haven’t listened to my wireless in weeks!